The airport also recently changed its name to Southwest Wyoming Regional, to reflect a wider focus. 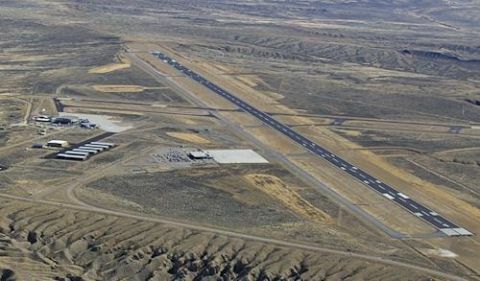 However, Brubaker and his counterparts at other Wyoming airports face the harsh reality that smarter marketing is not enough to preserve the level of commercial air service they want to provide. What’s more, local business leaders say that if commercial air service declines more than it already has over the past decade, they may not be able to survive. “Air service is the most important economic development for me,” says Mike Wandler, president and owner of L&H Industrial, which manufactures machinery for oil, gas, mining and other industries. The company is based in Gillette, WY, but has nine other facilities stretching from Alberta, Canada, to Chile. Wandler consequently serves on several boards and committees working to ensure that commercial airlines continue to fly into Gillette, Rock Springs and at least four other small cities in the state. For these communities and hundreds like them nationwide, customer demand is not enough to make commercial air service self-sustaining. Federal and state subsidies have helped keep service in place for more than a decade, but those funds are getting harder to build into budgets, leaving airport managers like Brubaker and entrepreneurs like Wandler searching for solutions. Recognizing the need for reliable commercial air service, the Wyoming legislature created the Air Service Enhancement Program (ASEP) in 2004. At the time, Wyoming had the fifth-highest airfares in the country. Many residents drove to neighboring states to take advantage of lower ticket prices, more flight options and increased reliability. For many years, ASEP was funded at about $3 million annually, with proceeds divided between five airports – Southwest Wyoming Regional (RKS), Sheridan County Airport (SHR), Riverton Regional Airport (RIW), Yellowstone Regional Airport (COD) in Cody and Jackson Hole Airport (JAC). More recently, the legislature reduced funding for ASEP to $1.2 million annually, which has depleted the program’s cash cushion. Money from ASEP is mostly used to fund minimum revenue guarantees—annual contracts with regional carriers that each airport negotiates separately. Currently, four carriers service airports in Casper, Cheyenne, Gillette, Rock Springs, Riverton, Laramie, Cody and Sheridan—all with their own schedules. Because the airports in Cody and Jackson Hole draw heavy traffic for tourism, they are more self-sustaining, Surdam notes. The three remaining airports will be left to fight for funding that is only enough for a single airport. “We think there is a huge risk of losing commercial air service in two of our communities unless we do something different,” she says. In June, WYDOT formed a taskforce to review the funding problem and propose potential solutions. It settled on a plan to use capacity purchase agreements, which call for the state to contract with airlines for regular service to Wyoming airports. The format is currently used by large airlines such as United to contract with smaller carriers including GoJet for regional air service, but it has never been used by a state or federal entity. Under the plan, the state would secure a long-term contract (10 years is suggested most often) with a single regional carrier that would serve all of the affected airports. That way, each airport would no longer need to negotiate annually with several different regional carriers. The proposal calls for funding the plan with $15 million to secure the long-term air service contract. WYDOT Director Bill Panos uses a local analogy to explain the idea: If there were five ranches in Wyoming buying cattle feed from five different companies, it would make more sense for all of them to buy feed from the same company for a bulk price and have more of a say about the quality. The plan has widespread support from business leaders and elected officials statewide, but must be approved by the Wyoming Legislature, which meets for just 20 days beginning in February to approve a budget. The goal is to gain legislative approval and implement the plan on July 1, 2019—the same day the state will no longer be able to fully fund the ASEP program. Even though several elected officials publically support the proposal and it is included in one of the governor’s key economic plans, proponents say legislative approval is still not a slam-dunk. In 2016, Wyoming Governor Matt Mead announced an initiative to coordinate and expand statewide efforts to diversify Wyoming’s economy. The initiative, known as Economically Needed Diversity Options for Wyoming (ENDOW), identifies efforts to secure reliable and affordable commercial air service across the state as a top priority for long-term economic growth; and ENDOW endorses the proposed capacity purchase agreements plan. Supporters of the plan point to a WYDOT-funded 2016 economic impact study that shows every dollar of state funds invested into commercial air service returned $24 in direct or indirect economic benefits. Without the airports in Cody and Jackson Hole, which skew revenue results due to high-spending tourists, the return on investment for air service development across the rest of the state remains a respectable $7.71 per every dollar spent. The current pilot shortage and stronger profit incentive for routes in and out of larger cities make it challenging for airlines to continue serving small cities. Also, as commercial airlines begin phasing out smaller jets that serve many Wyoming airports in favor of aircraft with 70 or more seats, it will become more difficult to continue attracting carriers to the state. Without creative solutions like the proposed capacity purchase agreement plan, Wandler and other business leaders expect things to get worse, not better. Flying national and global clients in and out of Gillette is critical to securing contracts for L&H, notes Wandler. Although the company is getting by with the three daily round-trip flights currently offered between Denver and Gillette, he would like to have connections to at least one other city. He also fears a bidding war will break out between small cities when air service gets tighter, and he doesn’t feel Wyoming communities are in position to win that battle. Surdam and others note that maintaining commercial air service in Wyoming communities is about more than keeping businesses profitable. Connections to hospitals and treatment facilities in other states are critical for cancer patients and other residents who are seriously ill.
Ron Wild is president of the Uinta Cancer Care Foundation, a nonprofit organization based in Evanston, WY, that helps connect cancer patients and their families with proper care. Sometimes that means flying from southwest Wyoming to the Mayo Clinic in Minneapolis or other treatment facilities around the country. As such, Wild works closely with Brubaker to improve—or at least maintain—commercial air service in and out of RKS. “Improving service would be great. Not having it at all would be catastrophic,” he says.